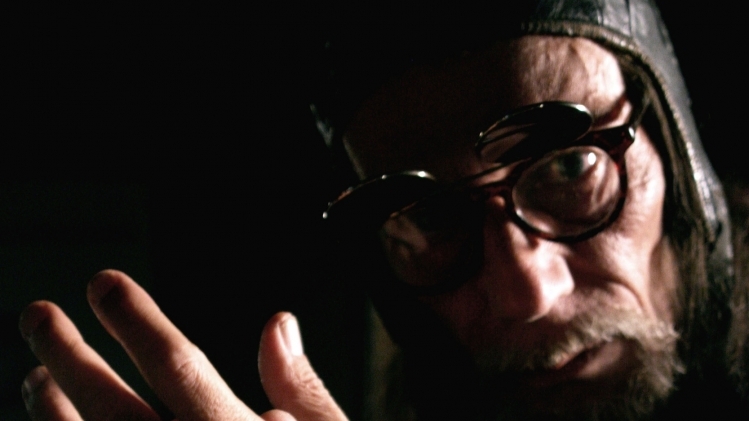 First BUGGY ROLLIN pilot with Jean Yves was Xavier Chantepy, “Mr X” or “PYX“. 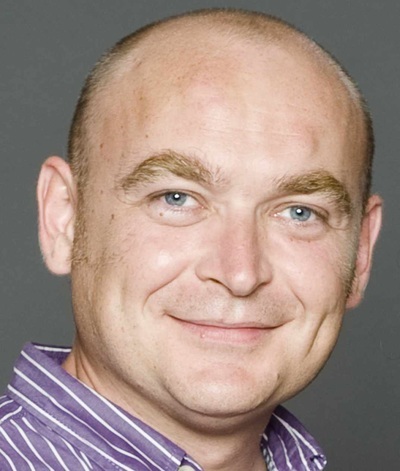 PyX was on the side of Jean yves from the early 1996 to help him create a company. 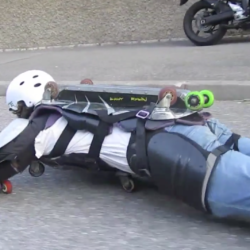 He was the first to crash hardly on the first BUGY ROLLIN downhill race in lausanne 2000. It was rainy, slippery, he was too euphoric for happiness of sliding, he could not make the cuve correctly. It was very bad to have him hurt so much. Now, he is way too much busy to ride regularly anymore. He owns a suit. His place is with us in the community and FIBRA. 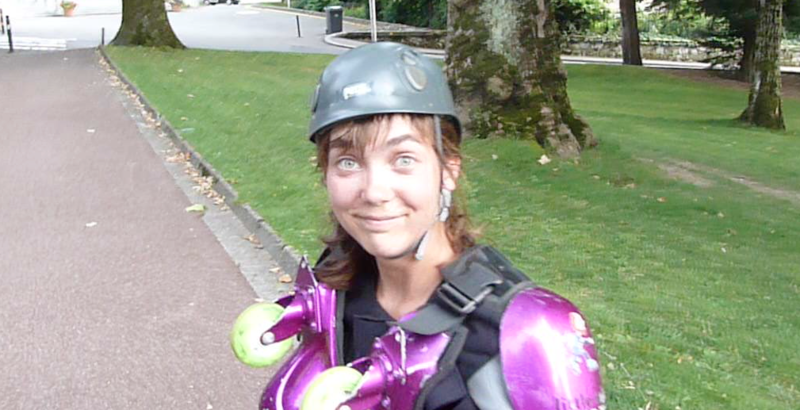 Second BUGGY ROLLIN pilot but first in heart was Virginie Alventosa “VA”. VA helped for the first photo and video Shooting ever at the Trocadero in june 1994 6 am,before the tourist come, with Bertrand Paumard as video director. She was the photographer. 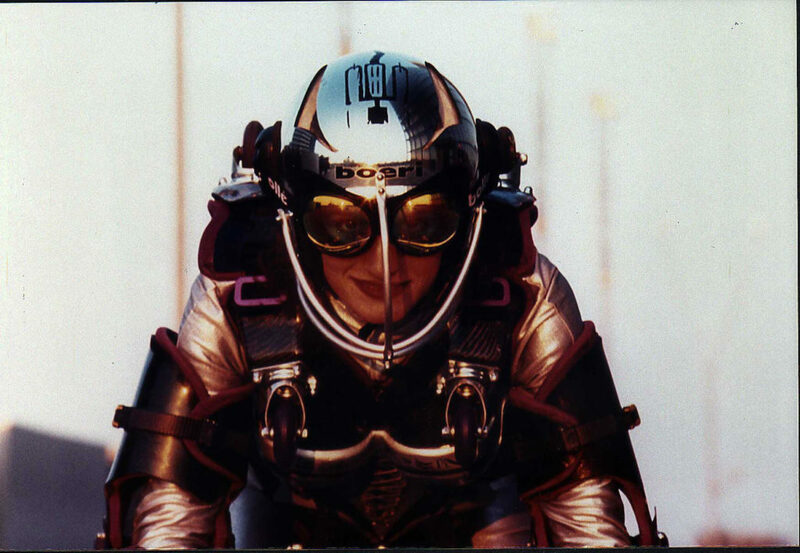 She also helped to pick the color of the first suit, that it would not make people afraid. She was a great help and a real gift from God to share short piece of life with Jean Yves. She accepted to come back 4 years later to shoot with christoph lebedinsky at “la Tres Grande Bibliotheque francois Mitterand in Paris. She stays as a star in the legends. “Pilliou” was underwear designer who helped with the bonnet design of the woman chest in 1998. The one that Virginie was wearing for the TBG shoot. 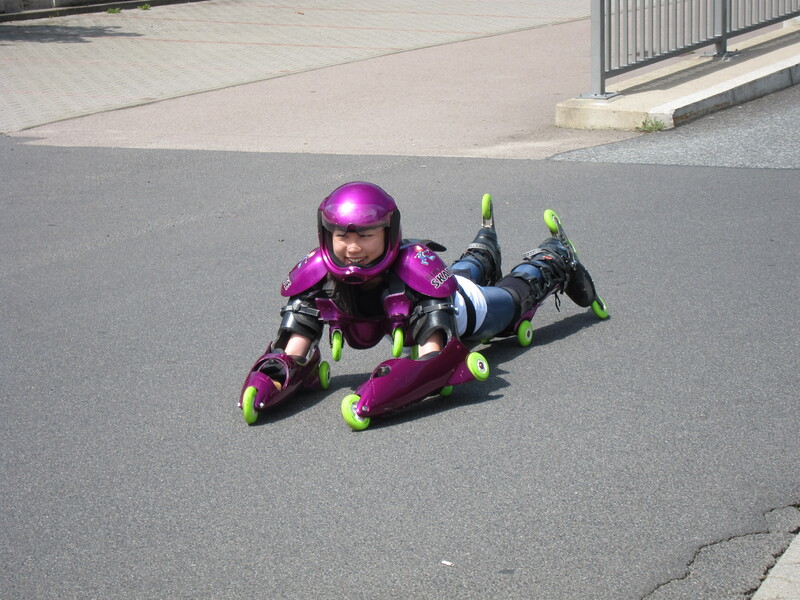 She wore the BUGGY ROLLIN suit only one time in paris at La Defense in 1999.
, was a good polyvalent skater in paris. she used her skate as locomotion all around the year. 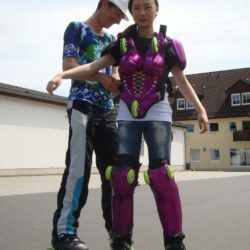 she said she would not take skate only once or twice a year. She could dance, slalom, and speed, very fast she was. like a lion on skate, she trained many time with Jean Yves. Together they made several show. Jean Marc Torres was dancer etoile for Maurice Benard. 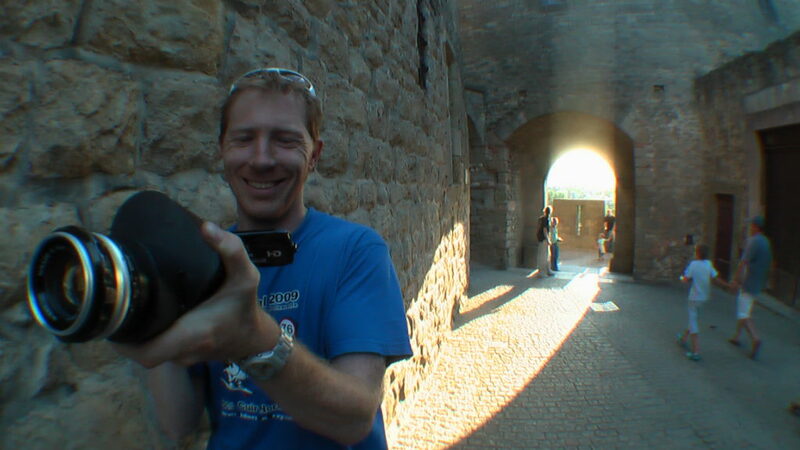 He contacted Jean yves in the 2000 to get him involved in his opera Jane Dark. together they could train at studio “la tortue” near Place de Clichy at Paris. 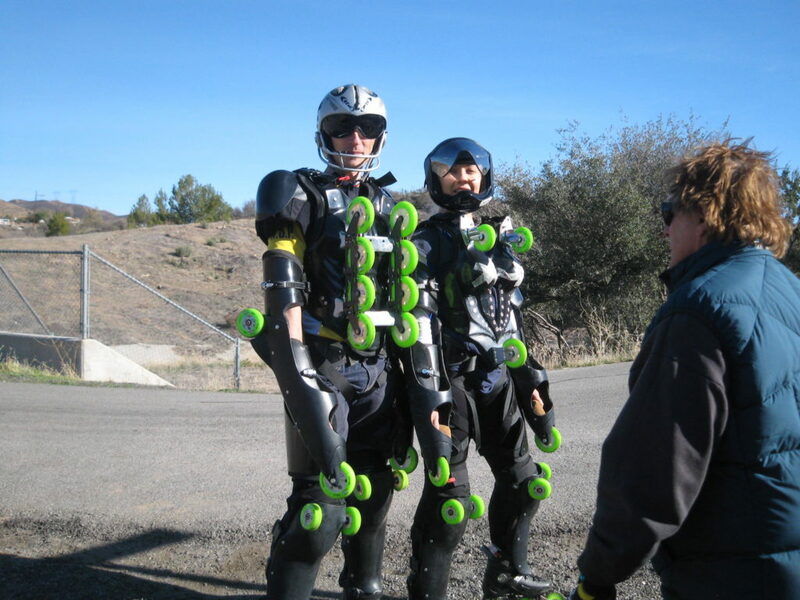 Torres made a ballet using the BUGGY ROLLIN suit with no wheel on the back. That’s for him that Jean Yves developed a soft comfortable back with no wheel. 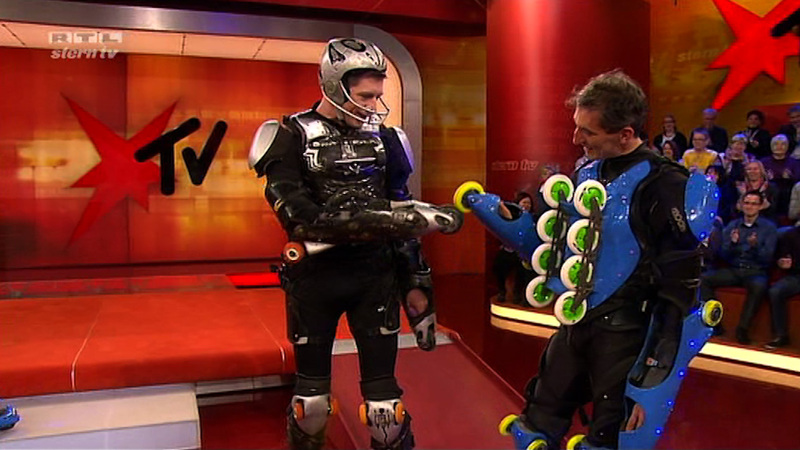 TORRES bought a suit, and Jean Yves marked the wheels at the name of ToRReS. Now the suit os lost somewhere in France. Torres died few years ago. Dousse was co-owner of a skate shop in geneva. 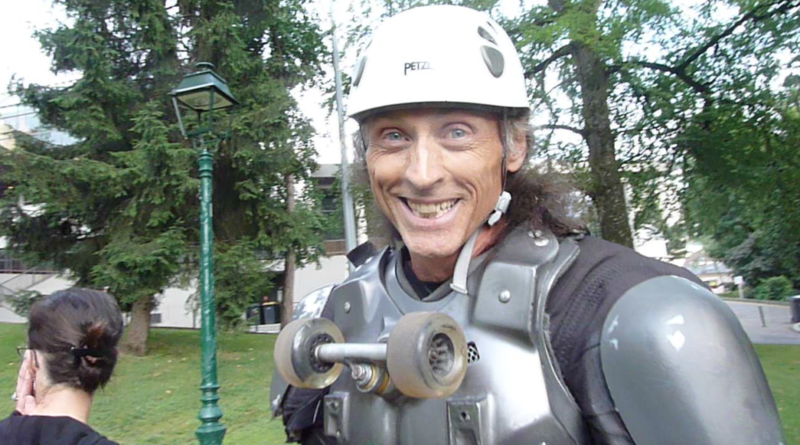 He now runs La TER skate association in Geneva He was a great downhill skater and enthusiast of BUGGY ROLLIN from the early days 1997. 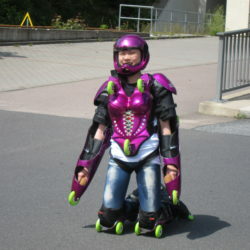 He always dreamed to own a suit for him, and practice BUGGY ROLLIN sometimes. Lina was a photo model from Hong Kong immigrate for love in Paris. Absolutely nice person, witty, dynamic, hype, she was model for shooting picture at studio blondeau 1998. Lisa was friend of Ghislaine Samir during years. They would skate together a lot. She was famous along the skaters for her beauty. One day she answered yes to come to make photo shooting in BUGGY ROLLIN with Jean Yves Blondeau at Lyon, with Marie. Hope to see you rolling with us again. 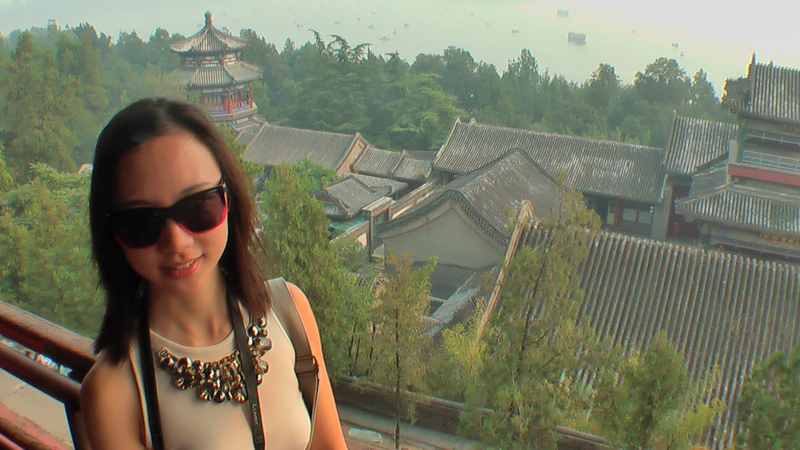 Marie is a perfect mix between asia and europe. Father from china Teaches Kung Fu and her mother form Italia is dancer. She got strong character, excellent body capacities, and she is maybe the best cook ever met. After shooting, we were spending hour appreciating her estounishing gourmet food. It was hard to come back to skate afterward. She was very enthusiast for trying BUGGY ROLLIN. She could not wait, and wore the suit already in the flat two minutes after her arrival. It would be great that she rolls with us again. They run “aux fetes enchantees” a clown entertainment company in Lyon. They are both good skater. 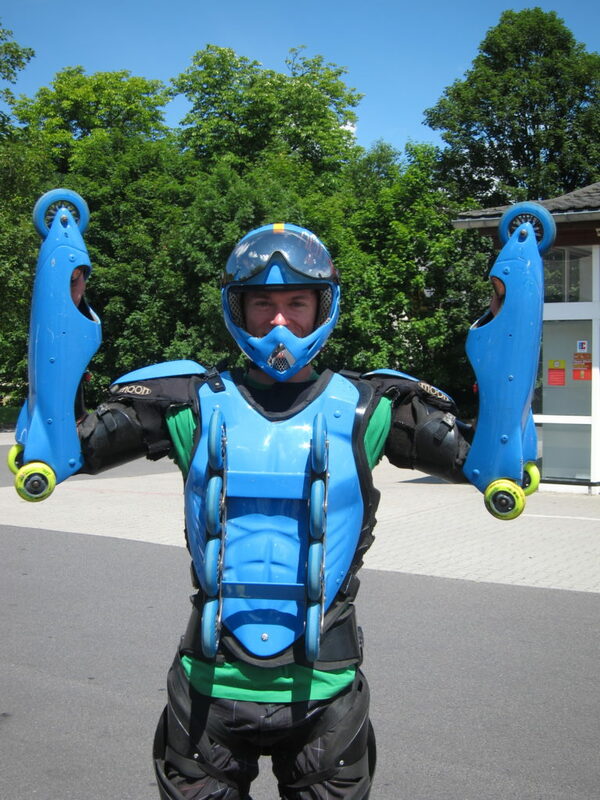 Mathias is famous for going on downhill race with his professional costume : clown. He can make curves on the wrong foot looking completely sketchy but perfectly mastered. Real artists and good spirit they jumped in the suits for the Lyon Shooting with happiness and good cooperative mind. join Sebastien laffargue to launch Seba Skate and now FR skates. He was living in germany when he visited Jean Yves in Frankfurt and spend several days buggy rolling together. 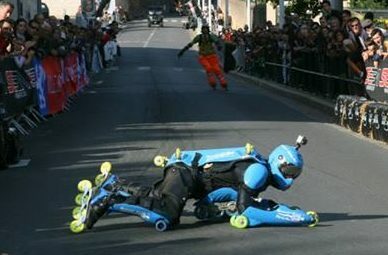 he did roll several times with buggy rollin suit. He had always been a nice support of BUGGY ROLLIN. With him Jean yves could go to china and korea. The last time even he rolled with his wife Montse. Hyun bin was a young boy looking like an indian from a western movie when he was involved in making a serial of commercial films for Korea Telecom internet access named Megapass. 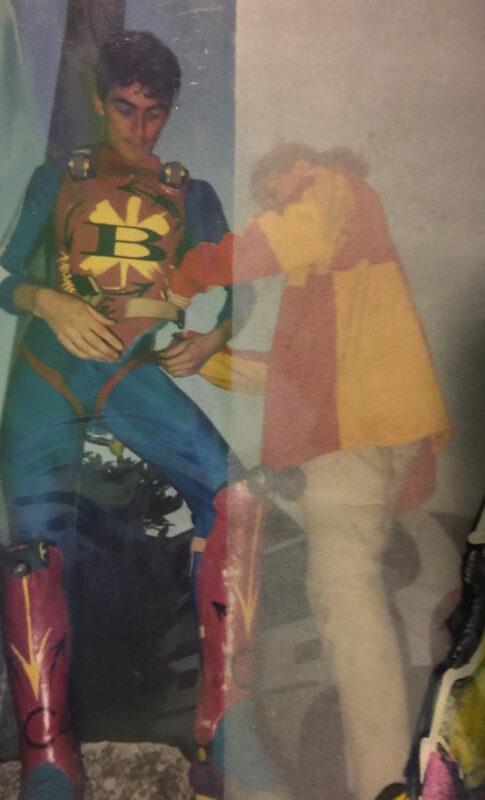 He had to wear the suit in Barcelona as Jean Yves was his stunt double. He had a rock and roll manager. He was very kind in any situation. At the end of the very long days of shooting the film we were going altogether to restaurant and come back to hotel by skate in the night. this is good memory. As many of the people of this list it is a pity that the connection is lost. He is now a great star in Korea, made very nice dramas, that jean yves could see only a few month ago. PSY never rolled with the BUGGY ROLLIN suit. But he was a nice help to cheer up in Busan when time was hard and sad after Chae Sun left. He bring Jean Yves several time on the set the movie he was making in Busan. 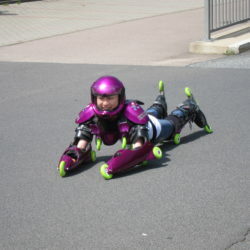 He came to Muju Resort as Jean Yves was performing BUGGY SKI to celebrate solnal. He was very interested in Stunt and Action sports. We miss you ! Chae Sun met Jean Yves in the KTX, korea speed train from Seoul to Busan. A nice alchimy worked almost instantly. Smart she was maybe the most. The way she was making her way through life was a model for Jean Yves. 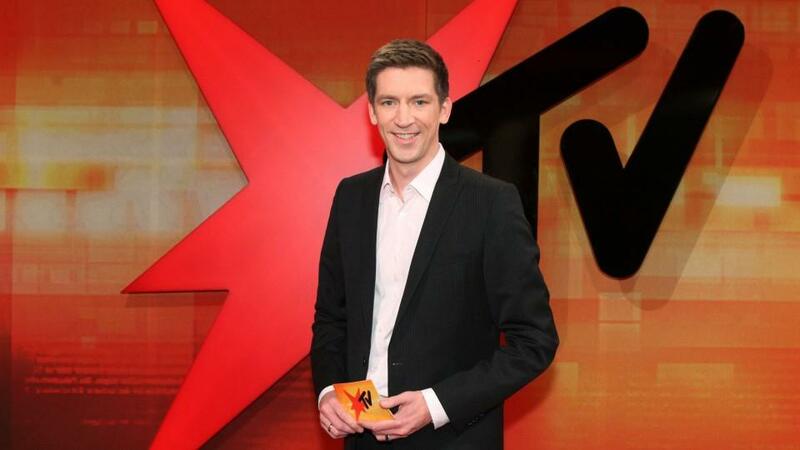 It decided Jean Yves to learn mandarin at the age of 40 years old. 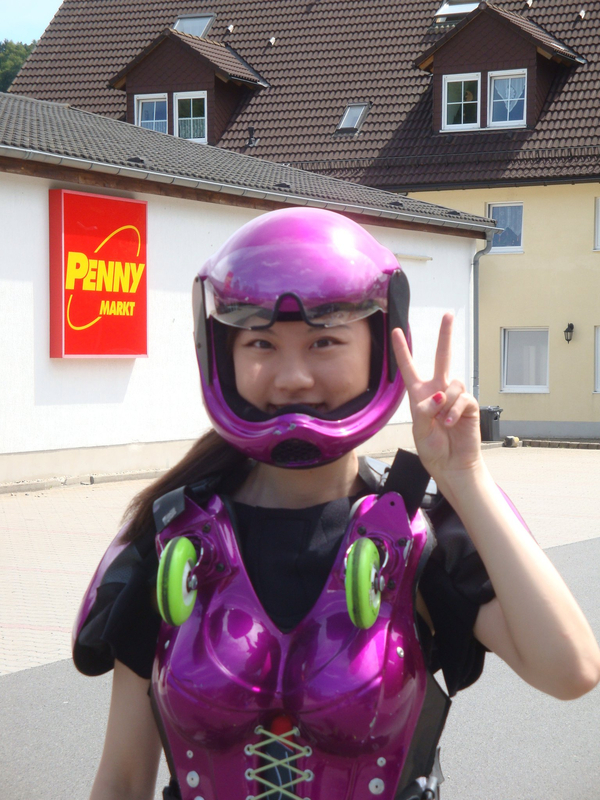 She wore only the helmet and glasses of BUGGY ROLLIN, but she did it so well. Maybe one day there will be a song about her. She helped a lot to find the right material very efficiently in South Korea. Nobody could be as efficient as her. Farewell Chae Sun you are never forgotten. 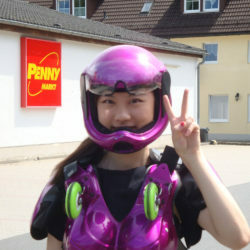 She is the agent of Jackie Chan in South Korea. One day she showed the video of the commercial film that was running in South korea for Megapass made by Jean Yves in Silver suit. She said ” Jackie, you MUST put that in your next movie !” So we did CZ 12 with Jackie Chan. She also take care of a K Pop group of boys named JJCC. We spoke for a long time to make video together. that for, we trained the boys in alpensia, the place of olympic games. Thank You Sasha hope to work together soon ! Jackie owns a suit and made some copies for exhibition. We spoke during u=one year and half before doing the movie. There are many stories as we spent one month together. 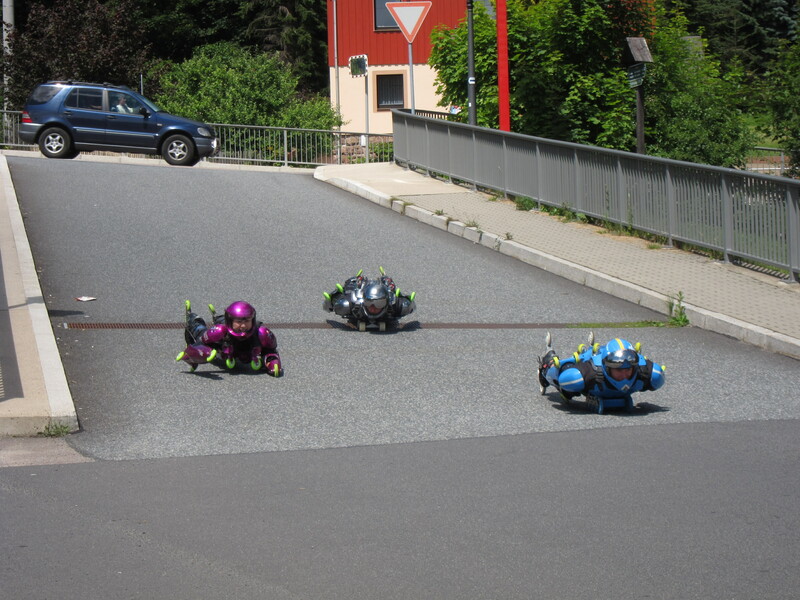 at the beginning, he did not trained for BUGGY ROLLIN. Maybe he thought it was easy. but to make a movie we need perfection. at each take he said “OW difficult !” so he spent time to train with Jean Yves on the set and became good. He could go on downhill by himself. He is strong, faithful, and kind. Friendship is important to him. Maybe we will make a second film together ? His Stunt team chef He Jun is running the JCST Jackie Chan Stunt Team and JCST training center where actors come to prepare their action of next movie, and future stunt player are taught. he asked Jean Yves to join the training center. maybe a school of BUGGY ROLLIN in Beijing? Zoee did not like the BUGGY ROLLIN suit at all. She was not happy to rehearse at the studio. She was cold and unfriendly with Jean Yves who understood that she did not like it, because every one is different., and she is very special artist . No worries Zoee we love you anyway ! 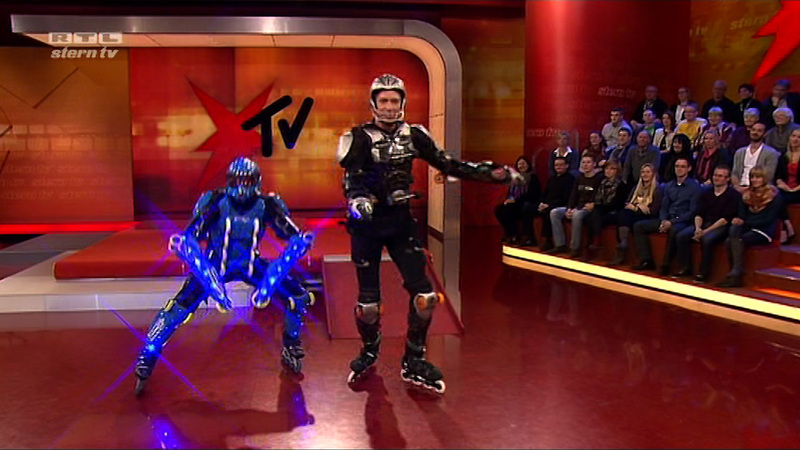 Jerome was making a daily show on french TV channel canal+ about inventions. 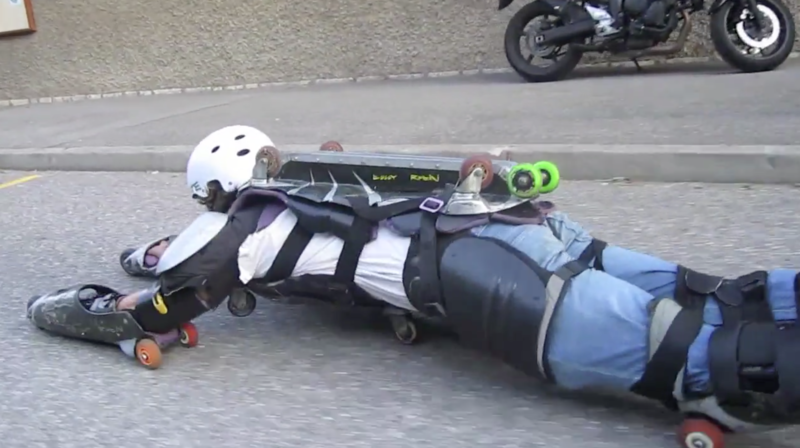 he sent Marius Doicov and Olivier Chapelle to make a film about BUGGY ROLLIN. That was the first time on TV IN THE WORLD 14 FEB 1997. 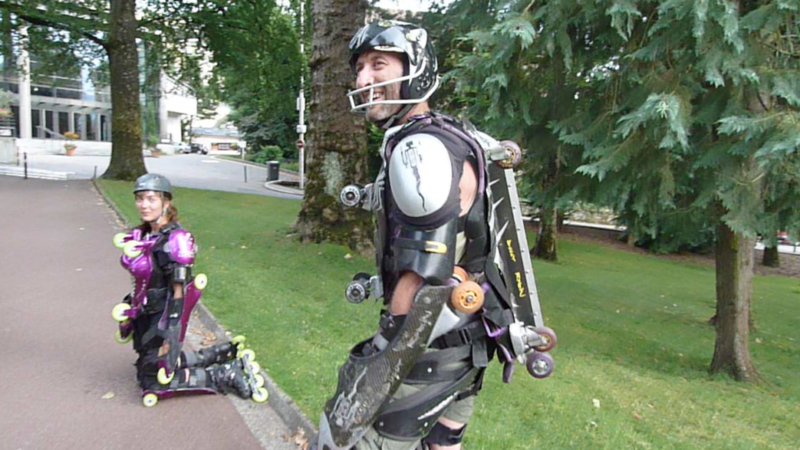 They made the report on the same places that Jean Yves made his video in the streets of Chambery. 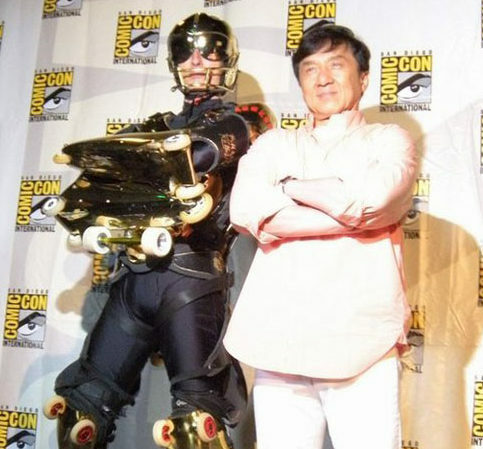 Jean Yves was at Comic Con San diego 2012 with Jackie chan for the promotion of CZ 12. They were waiting backstage their time to enter on stage. Siverster Stalone and Arnold Shwartzeneger arrived to introduce their last expandable movie. so at the same table there was Jackie, Sylvester and Arnold. 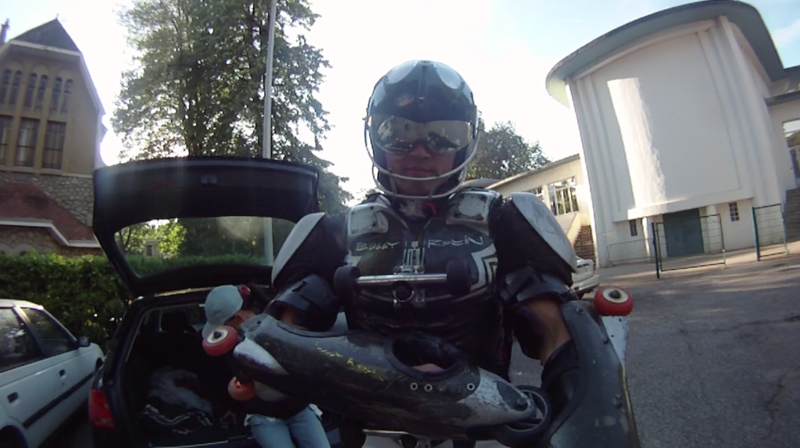 Arnold has something in common with BUGGY ROLLIN : it is about being like a robot in terminator. He made a nice welcoming to Jean Yves. Not Sylvester. His agent freaked out as Jean Yves was running on his stomach toward her as training. so she refused Jean yves to greet Sylvester. 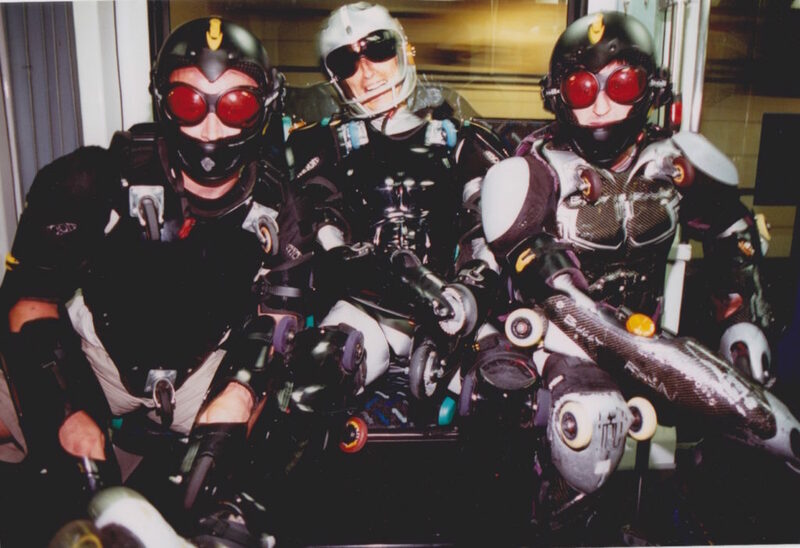 Monica Was chosen between dozen of other stunt girl in hollywood to stunt double Zoee Deschanel on Yes Man Movie. Her skill in skates made her the winner. 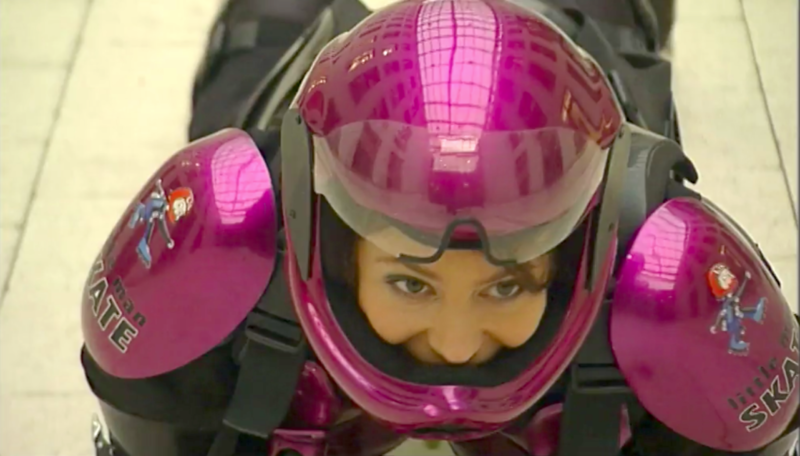 She had to train hard every day to get the level enough to make downhill performance in the spectacular Decker canyon of north Malibu at full speed. She was nominated at the taurus award for it. We wish that she would keep on rolling with us fi she would have wanted it. 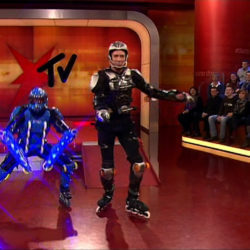 Thierry was making BUGGY ROLLIN video 10 years ago with suits that can go in the grass and even on ice and freestyle slalom. He never met Jean Yves, and does not publish anything like this anymore. 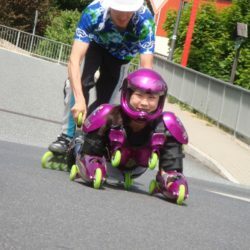 Kyung ae met Jean Yves at the Pundang Roller Club near Seoul. She was a very good skater, without doubt the most beautiful skater in the club, and certainly the fiercest. She has the discreet and faithful charm of Korean women. We would like her to have more stable health. 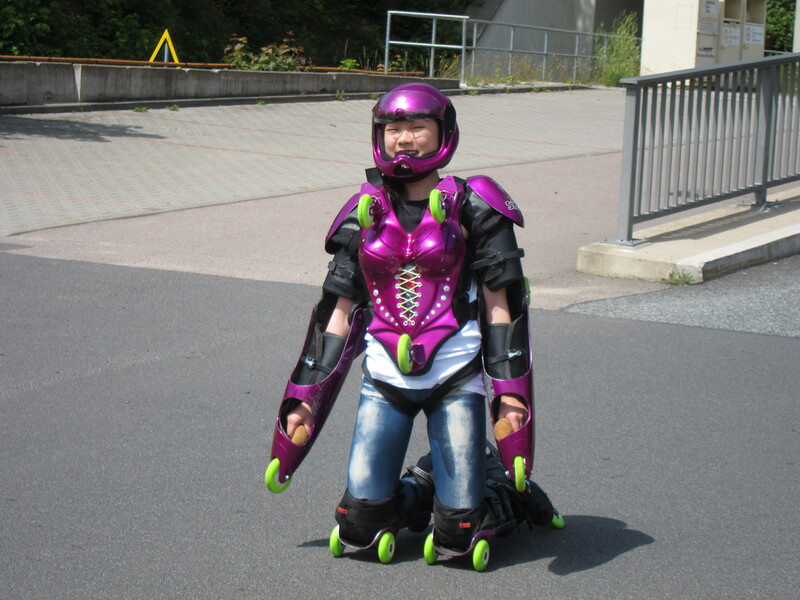 She tried the BUGGY ROLLIN armor for the first time in korea in 2008. She trained several times thereafter. She even participated in the race track Bob de la Plagne in 2012. We would like to see her on wheels more often. She has her special designed woman suit, but never used yet. 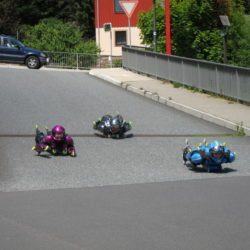 Severine tried the BUGGY ROLLIN suit at the downhill race of Almabtrieb of 2010. 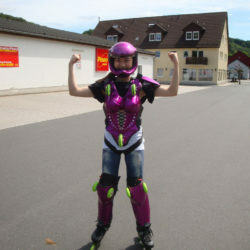 She was very funny making a lot of jokes, as streetluger, she tried barefoot that she would avoid wear roller-skates . Good friend of Jean Yves, living in the same village, Cedric is a Kung fu master. He had no problem to try the suit with good mood. Niece of Jean Yves She helped him to build the suits for Jackie Chan movie CZ12. Perfect body, very skill full and well balanced mind Maeva is a piece of perfect girl with in a very independent life style. She tried BUGGY ROLLIN only once but it was a nice experience. Friend of the Mother of maeva, Christian wanted to have the experience of using the BUGGY ROLLIN suit. It was not so easy for him, but he succeed with happiness. 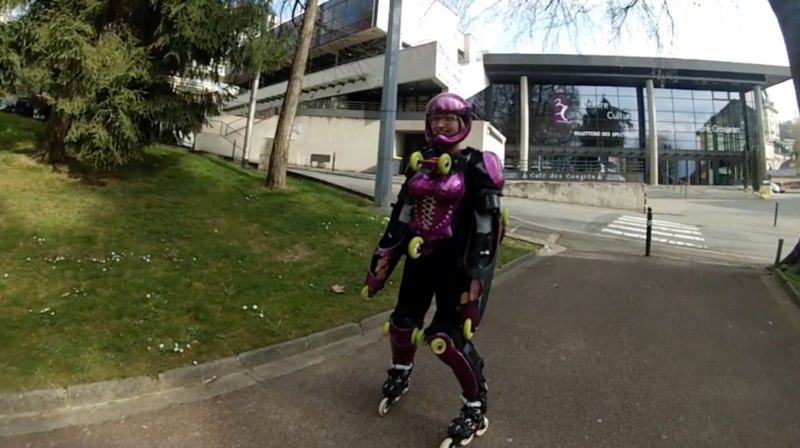 Guillou is good friend of Jean Yves, partner in training at Chambery’s roller club, he is a top class freestyle skater. 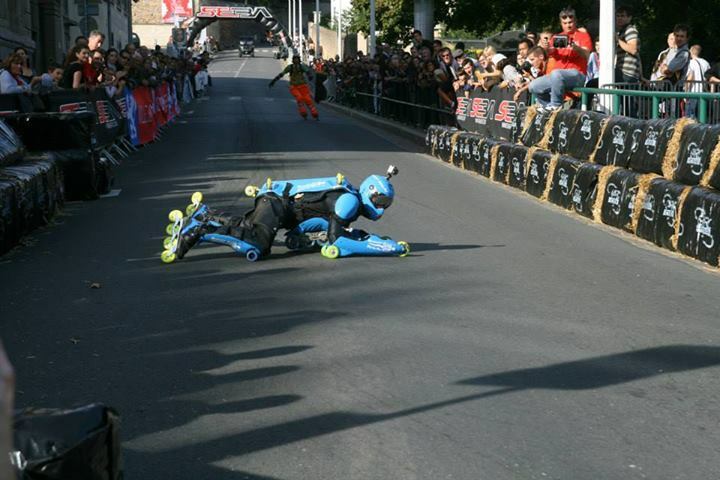 We hope that one day he will brake the record of speed slalom. He sometimes wear a suit in same time of Jean Yves during training. Jean Yves made him a special suit. He can Join the team anytime he would like, we wait for him. She is like Herve a world class freestyle skater. She stopped her international career a few years ago and now goes triathlon. BUGGY ROLLIN is easy for her. 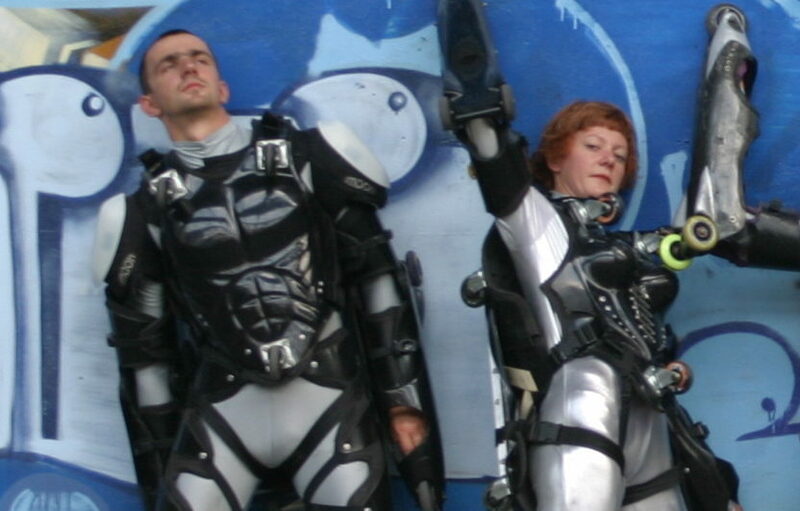 With Herve they made a lot of lovers jokes in armor. 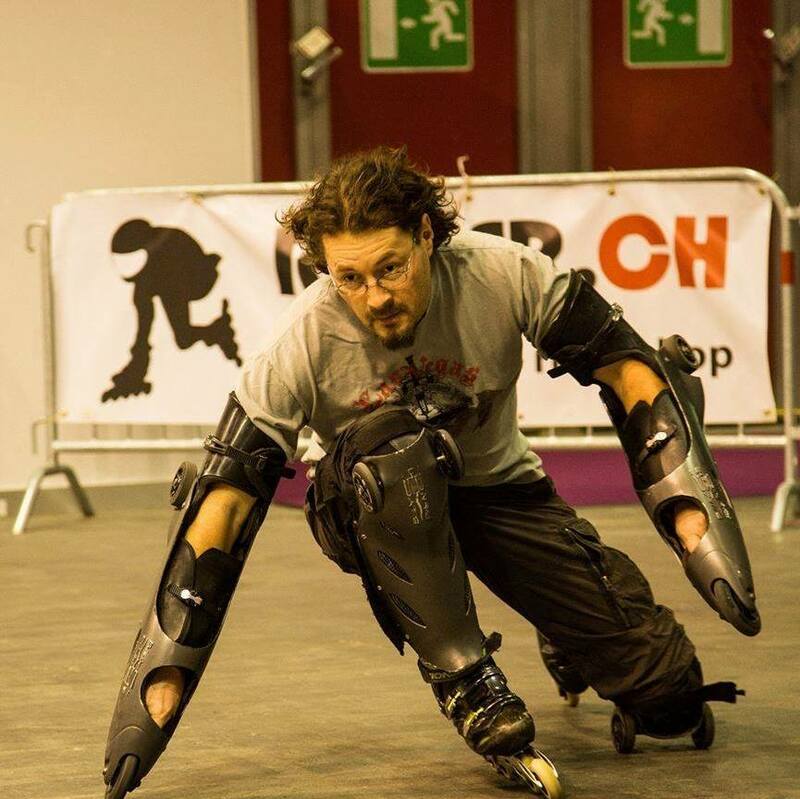 Ex president of WSSA, the world federation of freestyle skating, An is a complete athlete. Run fast, jump high, and care about roller skate club in Incheon every sunday. 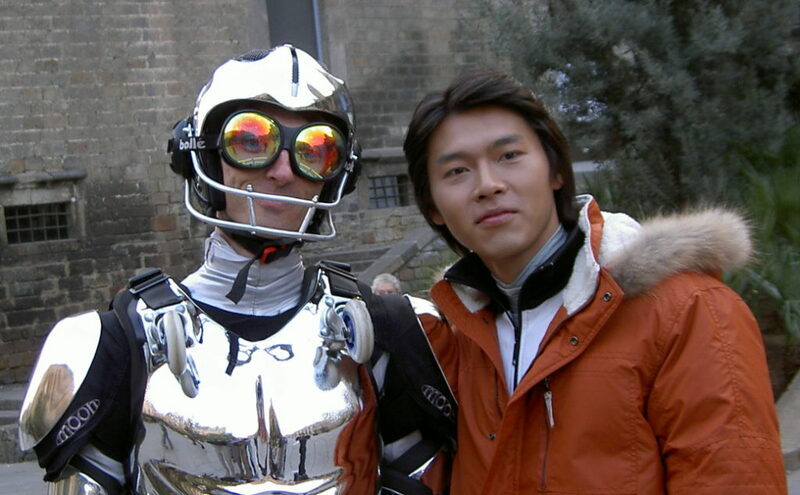 He met Jean Yves in Seoul for a TV show in 2005. He came to France and stayed at Jean Yves home to practice together before going to Beton On Fire race in bob track in Germany. 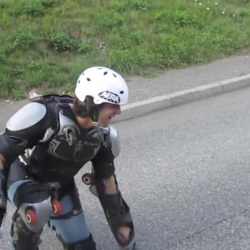 Yvon is a kind of person that used to be able to get gold medal on inline skate, longboard, streetluge, and buttboard on the same world class competition. He is also very smart, has a great artistic sense, and make great videos. 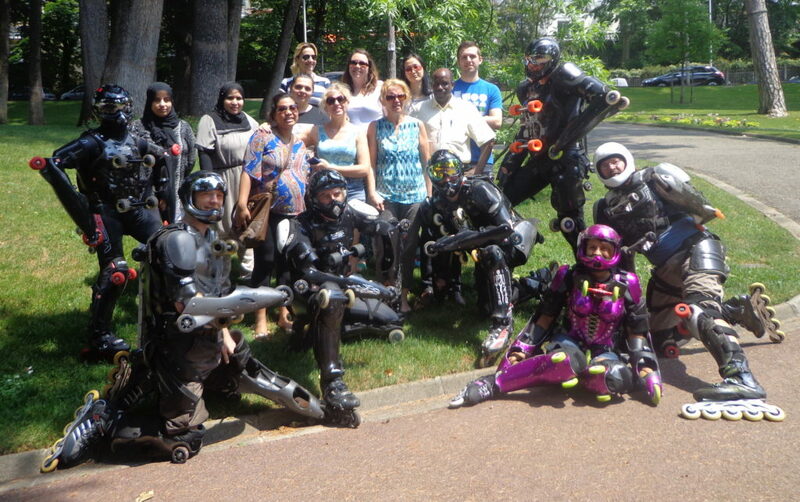 With his nice wife from argentina, they had a test course at the first BUGGY ROLLIN CAMP june 2015. Of course he was good. He tried the suit at the “Graveyard call” race near Annecy in France. he said “it is inspirational”. Condition were maybe not here with kidding and laughing skaters around him. He did not pay attention to any advice Jean Yves would say. But he managed to keep on trying courageously . 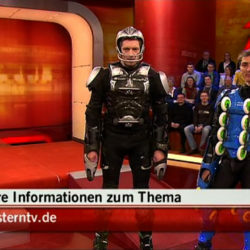 The cute nice presentor of Germain Tv In.Puncto and radio SWR3, tried the suit after recording a program with Jean Yves Blondeau. She was nicely behaving, she paid attention, and she had smart observations. It was pleasure to teach her. 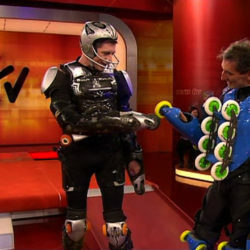 Speed skater, downhill skater, bob track skater, designer, multitalented he tried the suit in Altenberg ear 2011 with Jean yves as private professor. 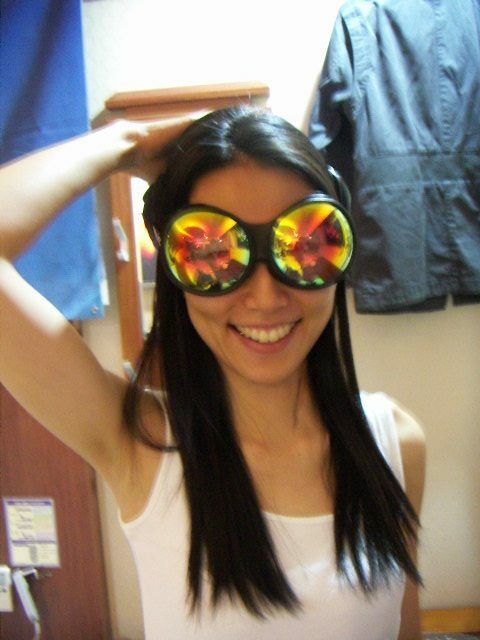 She was the translater of the precedent web-site. She helped a lot. She was curious and open minded, nice dynamic like a horse, enjoying every minute of life by mumbling songs. We miss you Yanran. 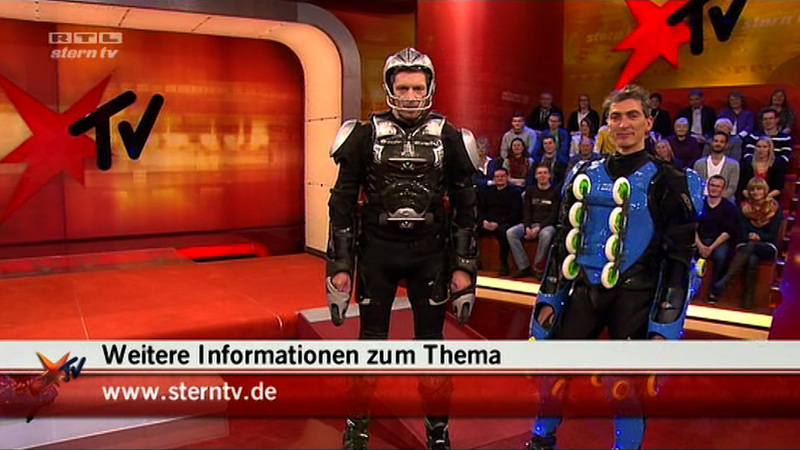 The presentation of Stern Tv Steffen Hallashka, tryed the suit on his TV set in 2013. He is tall has big head and big foot. He was nice and good willing. Nathalia is as smart as nice, as beautiful as athletic. The beautiful Nathalia came from Russia to slip into the pink armor for women created by Jean Yves blondeau. 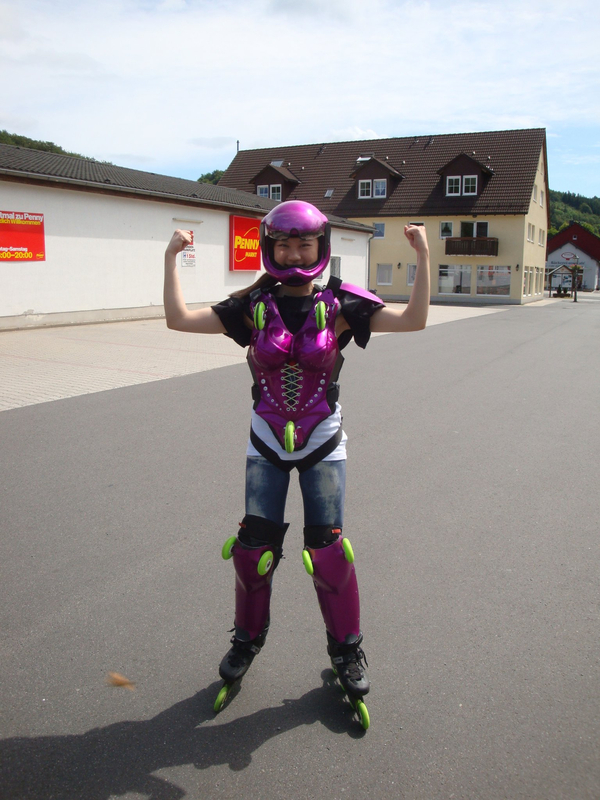 It was a beautiful summer day, it was good, she was good to ride in armor. she made a report for national tv news. 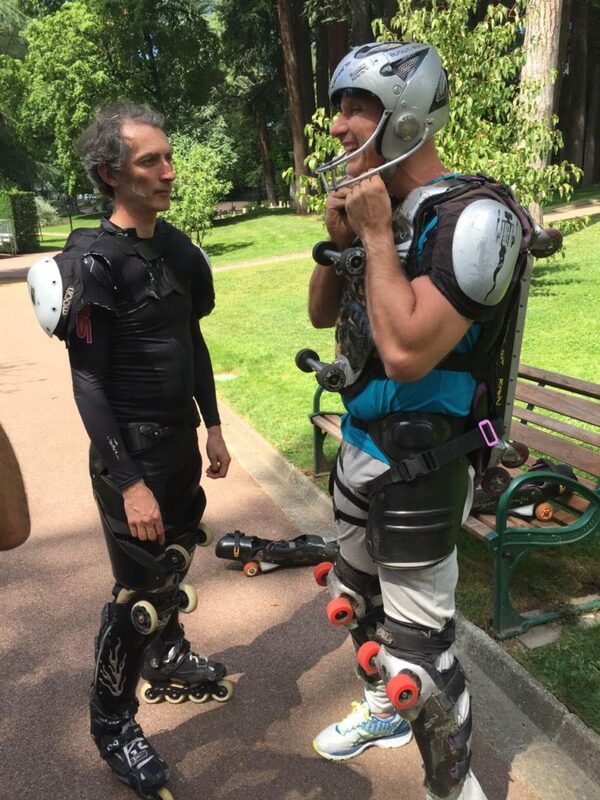 The presenter of the brazilaian tv channel globoTV came to the hoe of Rollerman, and tried the suit in Aix les Bain parc.